"The new tool-less blade guard system is easy to adjust and remove," said Joe Soto, product manager - pneumatics and residential construction. "But in addition to the convenient features, the 2705 combines accuracy and a large cutting capacity with plenty of power to rip 4x material in a single pass. This versatile table saw is ideal for use at the jobsite or in the shop." The 2705/2705X1 features a new tool-less modular blade guard system with adjustable dual side guards to allow for ease of measurement from the blade to the rip fence for cutting setups. The two on-board independent stowable anti-kickback pawls and riving knife/spreader allows for through cuts. In addition, the riving knife/spreader adjusts to three different positions for through, non-through and dado cuts - and it adjusts without removing the throat plate. The precision machined table top remains flat and true for accurate cuts, right out of the box. The right extension table allows for greater cutting capacity with the capability to rip 4"x8" sheets of plywood. Precision adjustment features include a 3/8" x 3/4" T-slot miter gauge with grooves that securely support cutting material for wide crosscutting jobs. The rip fence slides effortlessly across the flat table top for more precise adjustments. The 2705/2705X1 also offers plenty of power and a large cutting capacity. The 15 AMP motor delivers 4,800 RPM and has an electric brake for maximum productivity. The large cutting capacity (3-5/8" at 90° and 1-1/2" at 45°) can rip 4x material in one pass, and can use up to a 13/16" dado blade. Convenience features include a large on and off switch, and easy to read scale for fast adjustments. 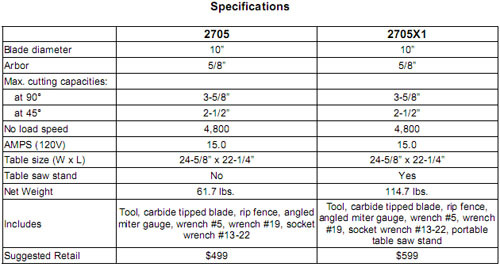 The saw has complete storage capacity to hold most commonly used accessories including saw blade, power supply cord, miter gauge, rip fence, push stick, wrench, safety guard and dado blade. The 2705/2705X1 is engineered for remodelers, furniture makers, finish carpenters, cabinet installers, decking and flooring contractors, and general contractors seeking a best-in-class 10" table saw for the jobsite or on the benchtop.